^ a b Lieu, Samuel N. C. (1992-01-01). Manichaeism in the Later Roman Empire and Medieval China. ISBN 9783161458200. ^ ), Saint Augustine (Bishop of Hippo) (2006). The Manichean Debate, by Saint Augustine (Bishop of Hippo). ISBN 9781565482470. Retrieved 2012-08-18. ^ a b "The movement of the Manichaean tradition along the Silk Road". Silkspice.wordpress.com. 2011-04-05. Retrieved 2012-08-18. ^ "St. Augustine of Hippo". Catholic.org. Retrieved 2012-08-18. ^ "九姓回鹘爱登里罗汨没蜜施合毗伽可汗圣文神武碑". Bbs.sjtu.edu.cn. Retrieved 2014-02-14. ^ Ibrahim, Mahmood (1994). "Religious inquisition as social policy: the persecution of the 'Zanadiqa' in the early Abbasid Caliphate". Arab Studies Quarterly. Archived from the original on 2012-07-11. ^ "CATHOLIC ENCYCLOPEDIA: Paulicians". Newadvent.org. 1911-02-01. Retrieved 2012-08-18. ^ "CATHOLIC ENCYCLOPEDIA: Albigenses". Newadvent.org. 1907-03-01. Retrieved 2012-08-18. ^ "Manichaean and (Nestorian) Christian Remains in Zayton (Quanzhou, South China) ARC DP0557098". Mq.edu.au. Archived from the original on 2014-08-08. Retrieved 2014-08-27. ^ "Central Manichaean Temple". 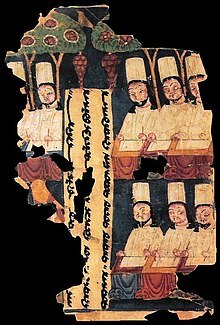 Manichaean.org. 2014-06-20. Retrieved 2014-08-27. ^ "Manichaeism, Esoteric Buddhism and Oriental Theosophy" (PDF). Retrieved 2014-02-14. ^ (2011-06-14 21:01:40) (2011-06-14). "天书降世 弥勒古佛说风轮真经全卷_龙华会聚原人_新浪博客". Blog.sina.com.cn. Retrieved 2014-02-14. ^ "Neo-Manichaeanism: Questions and Answers". Oocities.org. Retrieved 2014-08-27. ^ "Wednesday's Book Review: "A Tragic Legacy: How a Good vs. Evil Mentality Destroyed the Bush Presidency"". Roger Launius's Blog. 2017-06-28. Retrieved 2018-11-12. ^ "Home". archive.nytimes.com. Retrieved 2018-06-04. Ibscher, Hugo (1938). Allberry Charles R. C., ed. Manichaean Manuscripts in the Chester Beatty Collection: Vol II, part II: A Manichaean Psalm Book. Stuttgart: W. Kohlammer. Favre, Francois (2005-05-05). Mani, the Gift of Light. Renova symposium. Bilthoven, The Netherlands.